This is one of those projects which suddenly materialised out of nowhere. It’s not as if we didn’t have enough to be getting on with already. The last few months have been so busy, I’ve barely had a chance to photograph it all, let alone write blog posts about it. Then on top of that, both the computer and backup external hard drive chose the same moment to fail – what are the chances of that?! – and getting access to email accounts and websites again is requiring a fair few extra online hours to fit into the daily schedule. So it seems more than a little crazy to be adding to the project list. 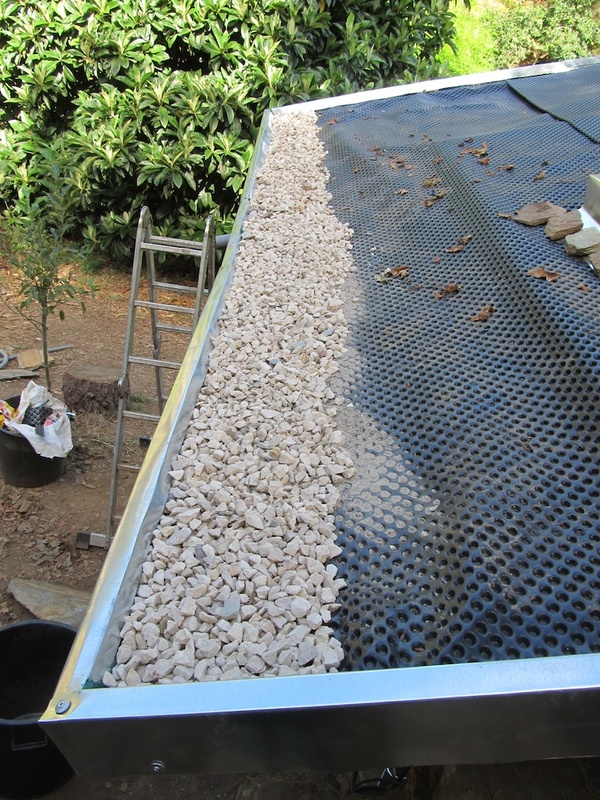 But with Liam, our ferrocement water tank specialist, going back to the UK for a few months and Wayne doing the same, work on the rainwater harvesting system came to a natural pause and this project sort of tumbled into the gap. 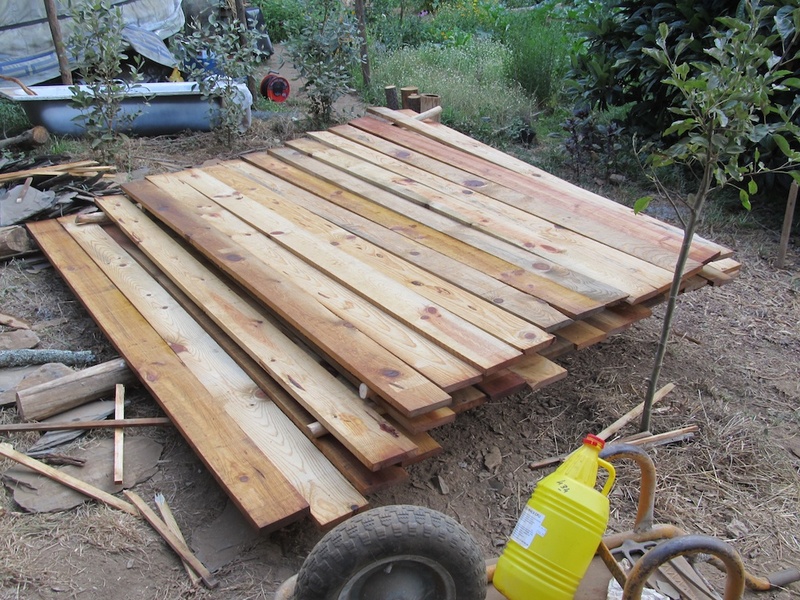 It started life as part of the solution to the problem of the leaning compost bin and log store, which was initially next up on the list of things needing sorted. 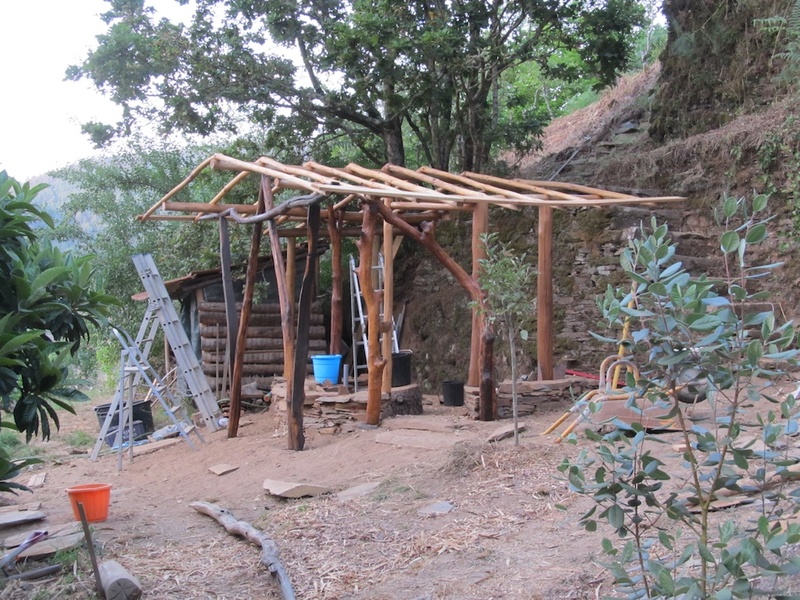 This structure was never built with a view to carrying a roof as heavy as it is and with the ground being so dry all Winter, since Spring the whole thing has been slowly leaning over to the point where it’s mostly being held in its present position by the compost pile in the compost bin. We need to dismantle it, restore it to the vertical, brace it, and re-roof it with lighter materials. 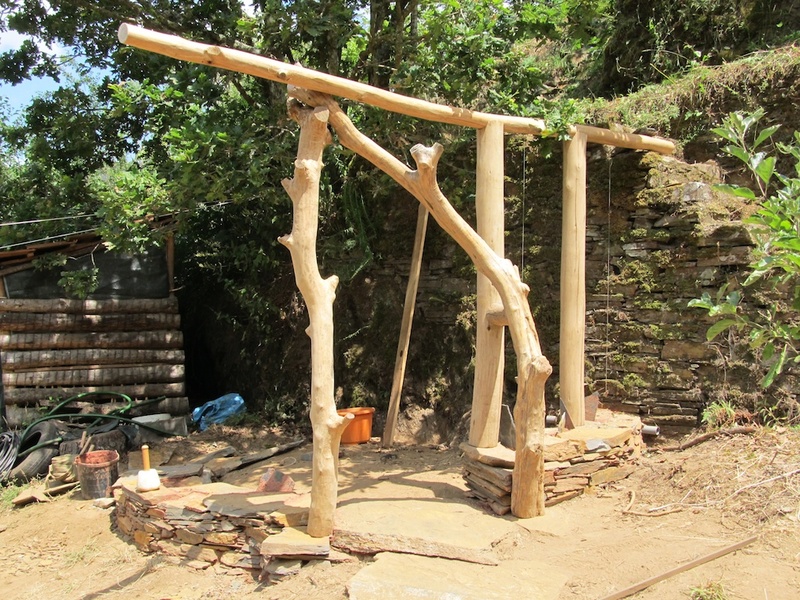 However, we’ve been using the log store section as a temporary enclosure for the compost toilet, so in order to rebuild, the toilet first had to go somewhere else. 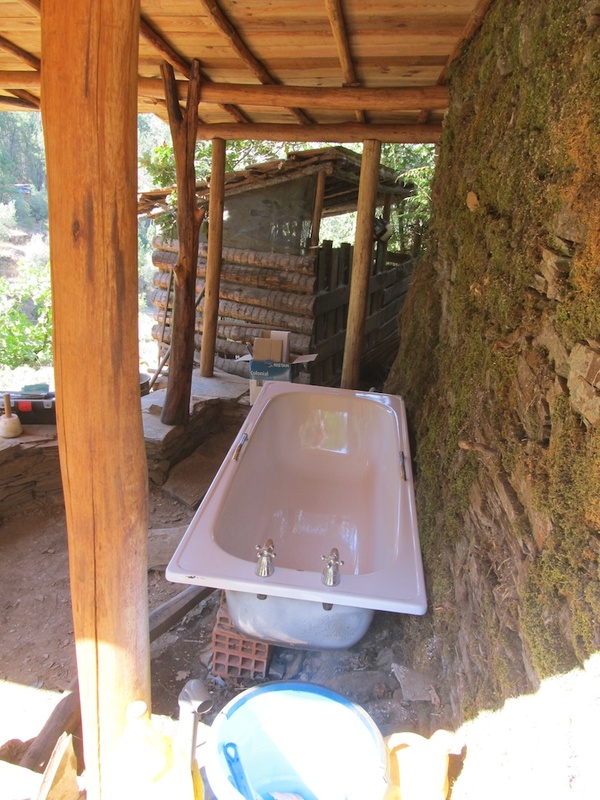 So I had the idea of building a small toilet against a nearby terrace wall. It could so easily have been something we could have knocked together in a couple of days from scrap wood, but somehow that just didn’t feel right. The ‘presence’ of a building has been around this section of terrace wall for a while and sometimes I sat here to see if it would appear in my head. 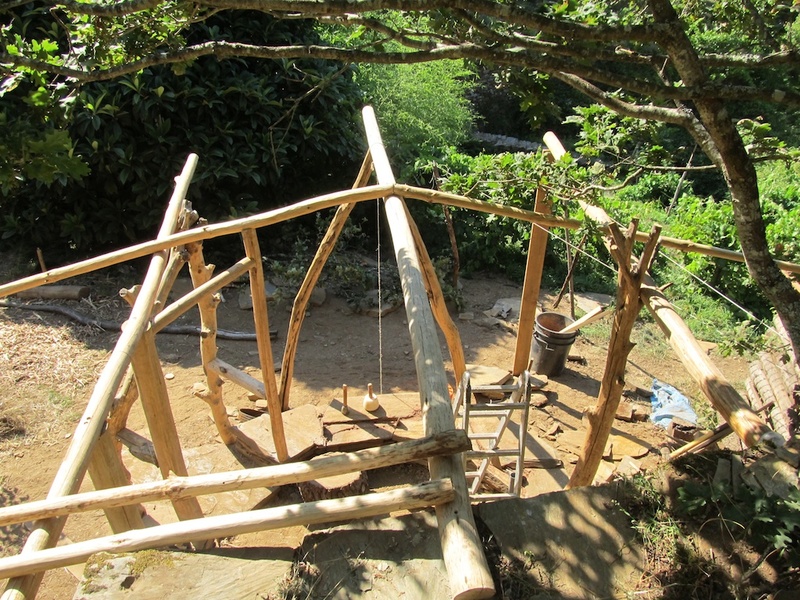 The images were vague; all that was clear was that it wasn’t another makeshift temporary solution and it was circular and built using natural materials. 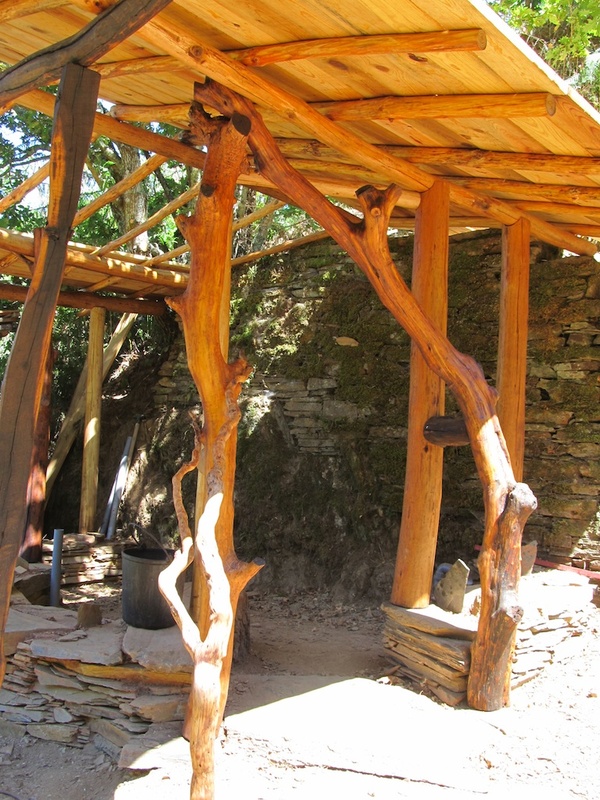 That struck me as perfect because it would allow us to experiment with all the materials and techniques we’ll need on larger projects elsewhere on a structure that wasn’t so important. 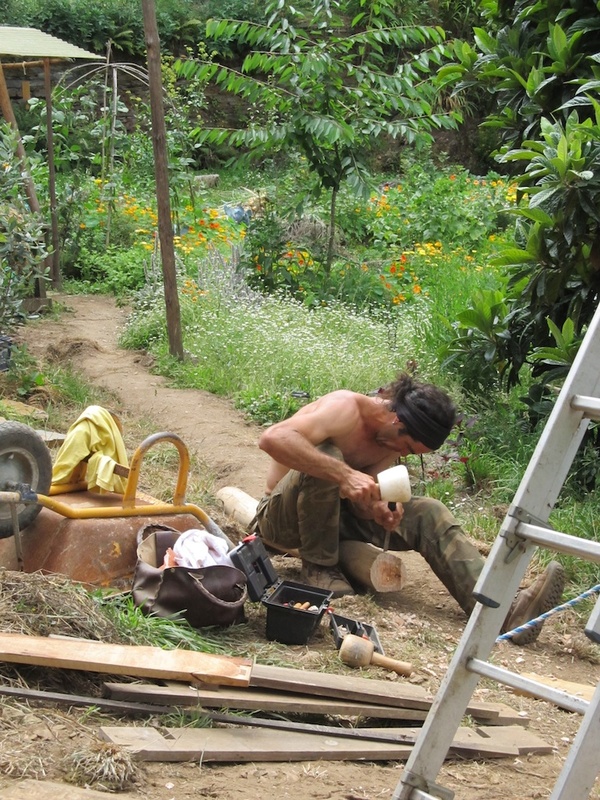 I was still focused on repairing the log store and wasn’t taking it very seriously. How seriously do you take a building you’re only going to be spending minutes in each day? 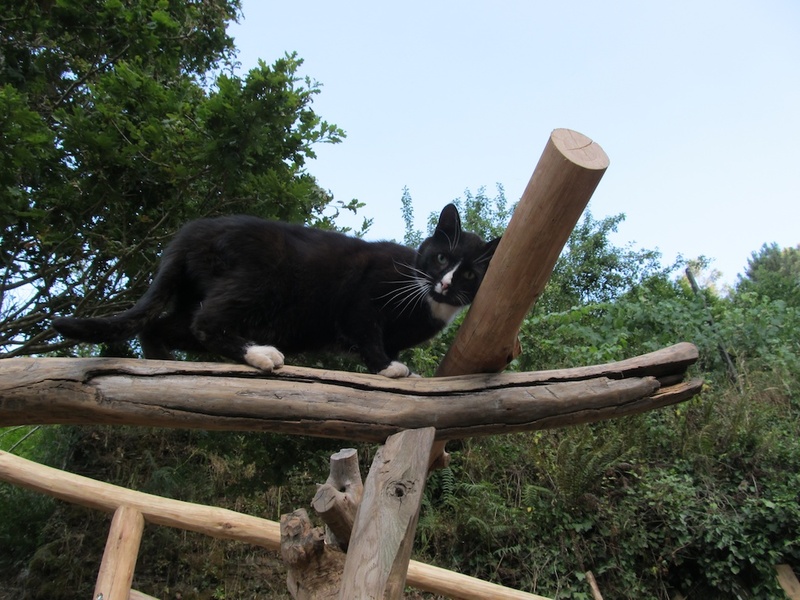 But as construction commenced, the building rapidly took on a life of its own, giving an almost palpable sense that it, not me, was the project manager here. 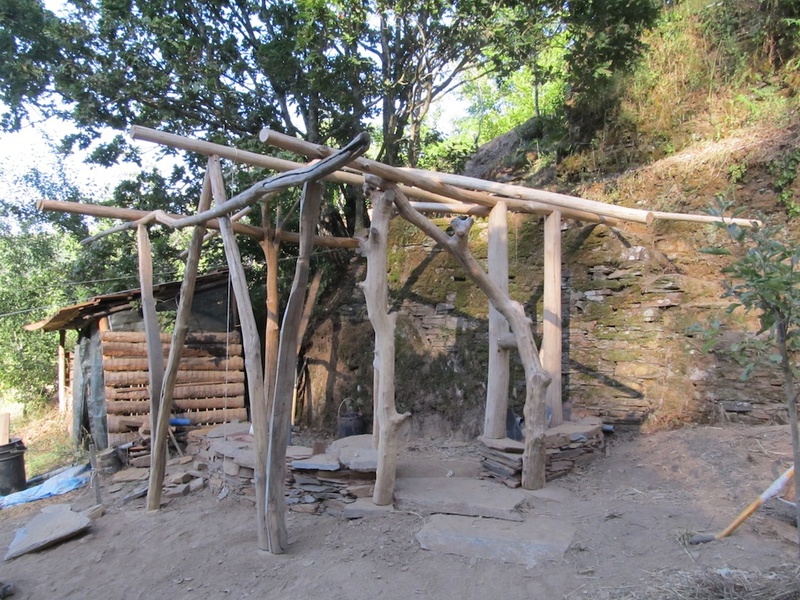 Everything kept falling into place with an uncanny perfection: the right stone was always to hand for the foundation walls; each length of scrap wood we picked up was ideal for the purpose in mind, even to the extent of being the right length; other scraps would catch a passing eye and suddenly a whole new idea revolving around them would fall into place. 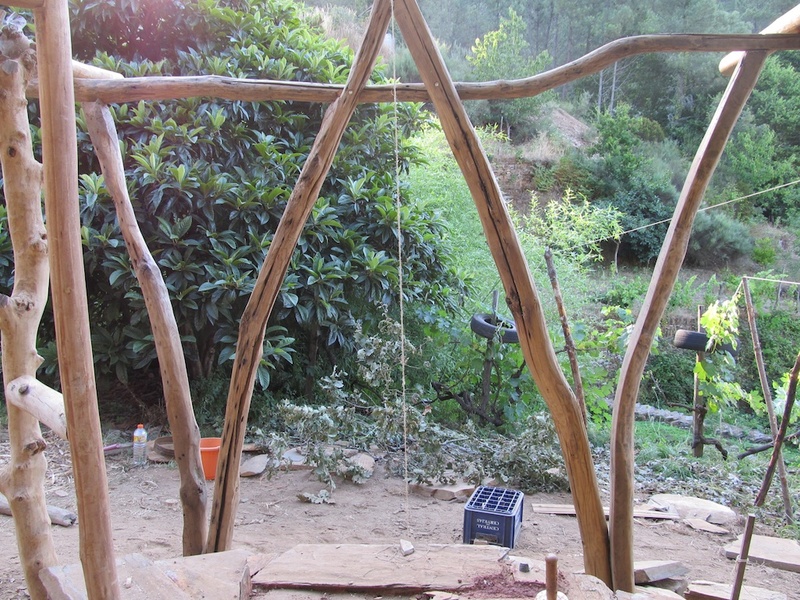 So far from being a ‘practice project’, it quickly evolved into a creation in its own right. One of the first things that became clear as it developed was that it had to be more than just a toilet. 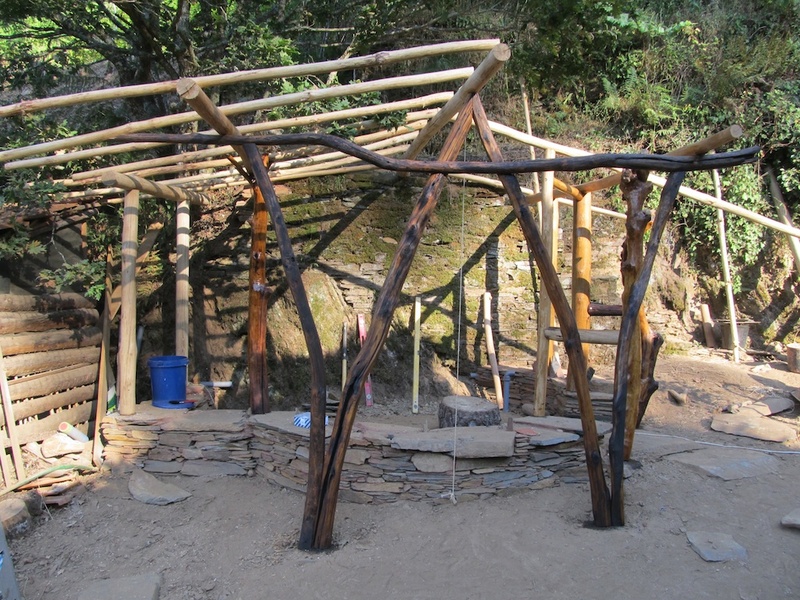 The thought of another winter in the yurt with no shower (the outdoor solar shower only works in the summer months) determined the rather obvious direction. 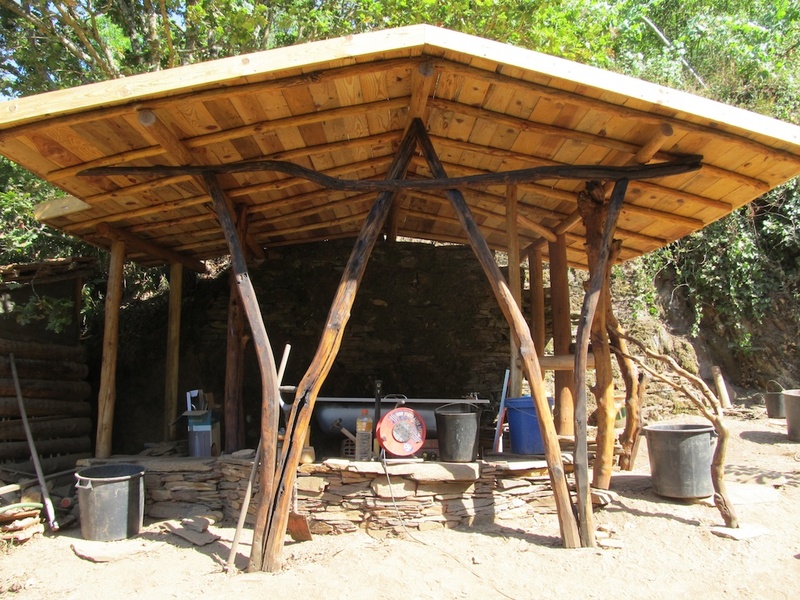 I already had a metal enamelled bath from our local Freecycle network in Scotland, got with a view to building a fire pit underneath it. Would it fit though? 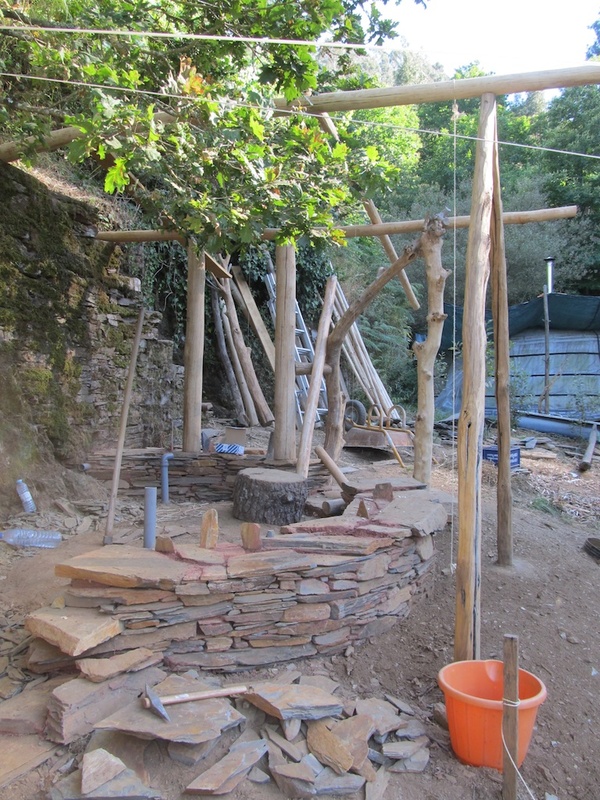 The foundation walls had by this time been completed two thirds of the way round and it looked tight. Again, it was no more and no less than the perfect size, as if it had been designed that way from the start. 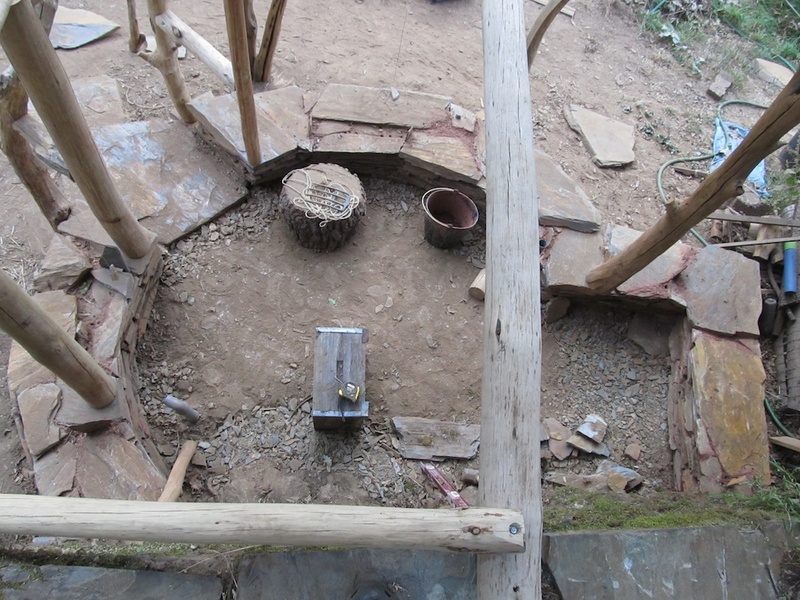 And the foundation walls were at the perfect juncture to accommodate a small addition for the toilet so it could have its own alcove within the building, which was perfectly positioned to vent the cabinet directly to the outside of the building behind the log store where no passing noses would encounter it (not that they do anyway if the composting toilet is used properly). The shower head and mixer tap I’d found in a sale on our last trip to the UK was the perfect height to fit under the ridge pole … and so it went on. 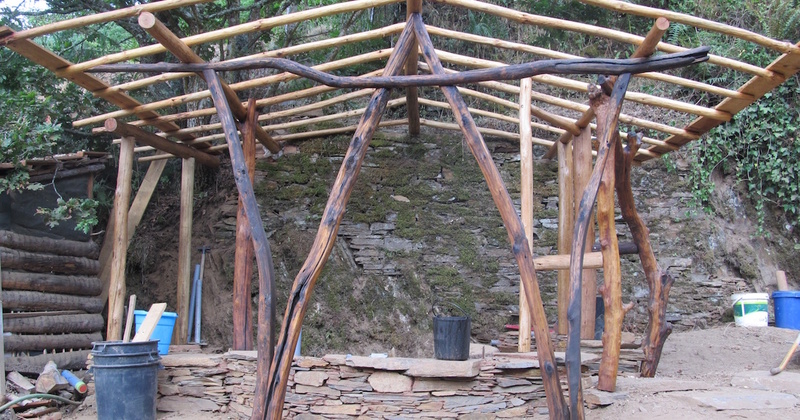 Whoever it is who’s directing this, the building or me, settled on a mainly circular timber-framed cob building with a rectangular pitched living roof. 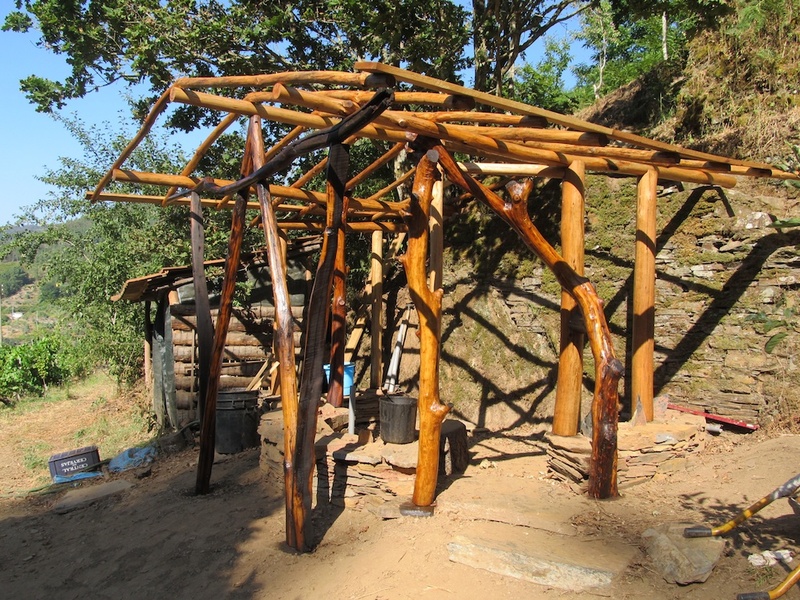 Cob is strong enough to be load-bearing with sufficient thickness, but since this is such a small building, I decided on a post and beam construction so the timber framework supports the weight of the roof rather than using disproportionately massive walls, though the walls will share and spread the load once they’re complete. 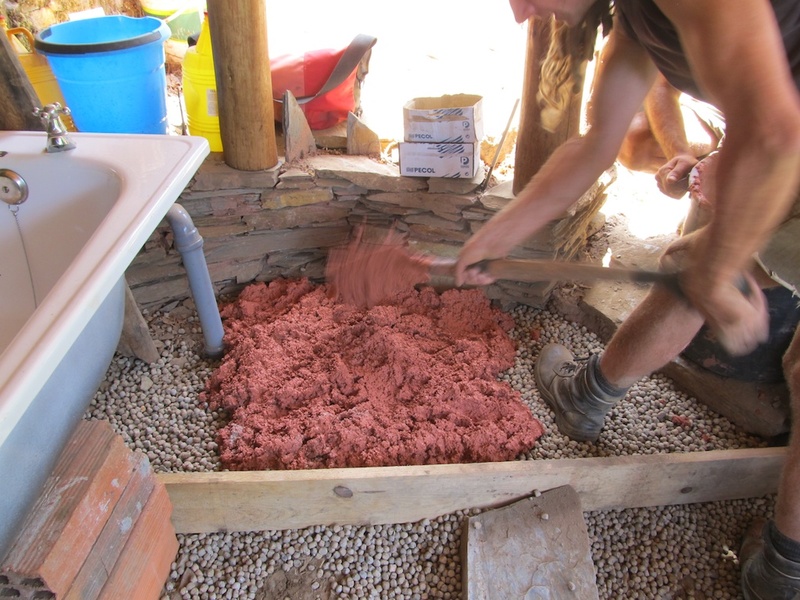 The cob walls will be around a foot/30cm to a foot and a half/46cm thick. 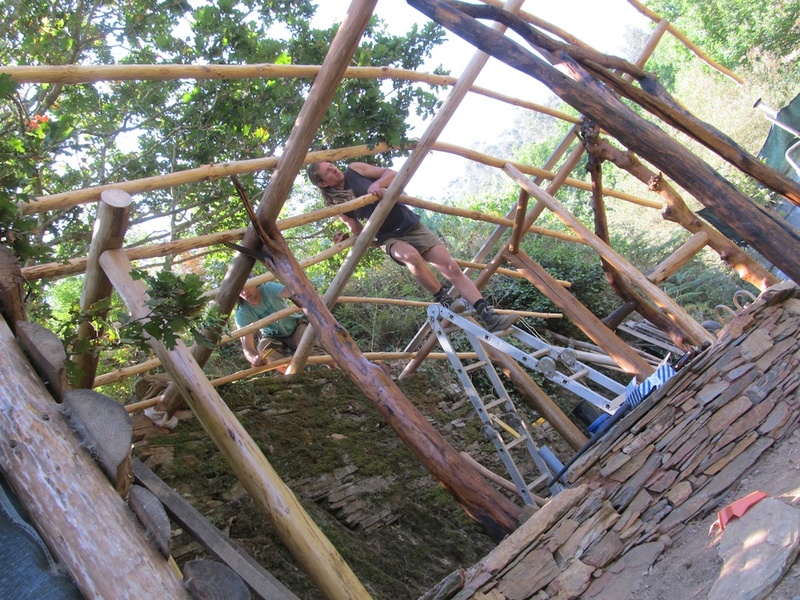 Constructing the roof first is also a great strategy for cob – it allows us to build the walls in all weathers, shaded both from the intense Summer sun and Autumn rain (if we get any) and providing slower, more even drying conditions for the cob. 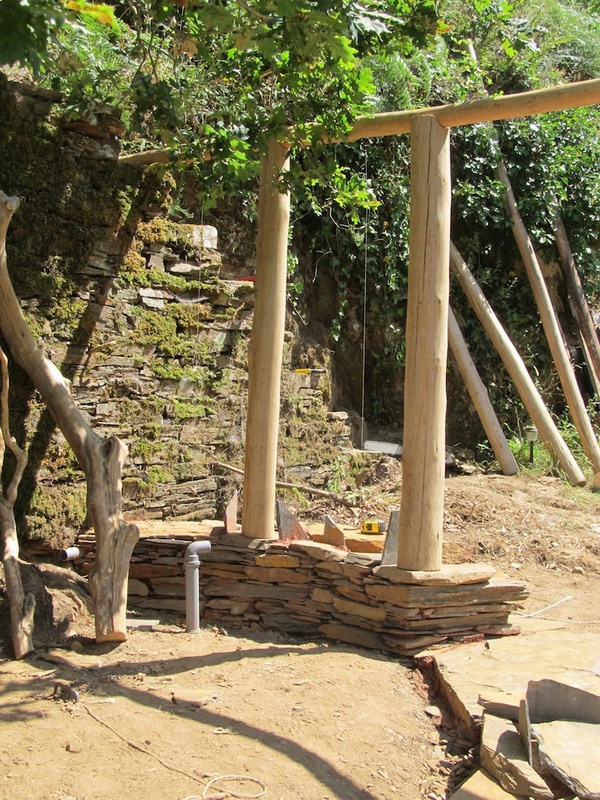 With the existing terrace wall and its steps forming the rear wall of the building, a pitched roof was the obvious choice as we could place the ridge pole at the wall height, anchor the timbers to the wall and use the steps for supporting one end of the main beams. 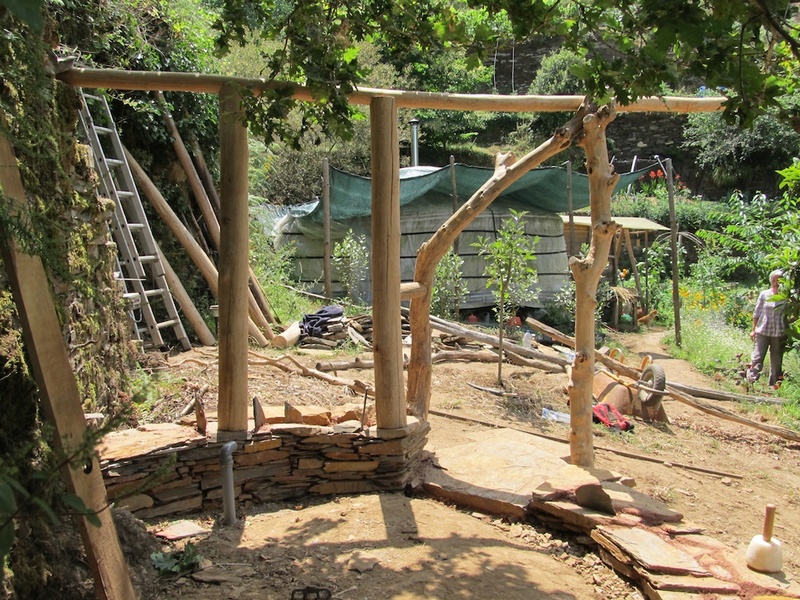 The only tricky bit was to extend the wall further along the slope towards the log store, building it up from the bedrock around the base of the overhanging oak tree, with suitable drainage around the tree. 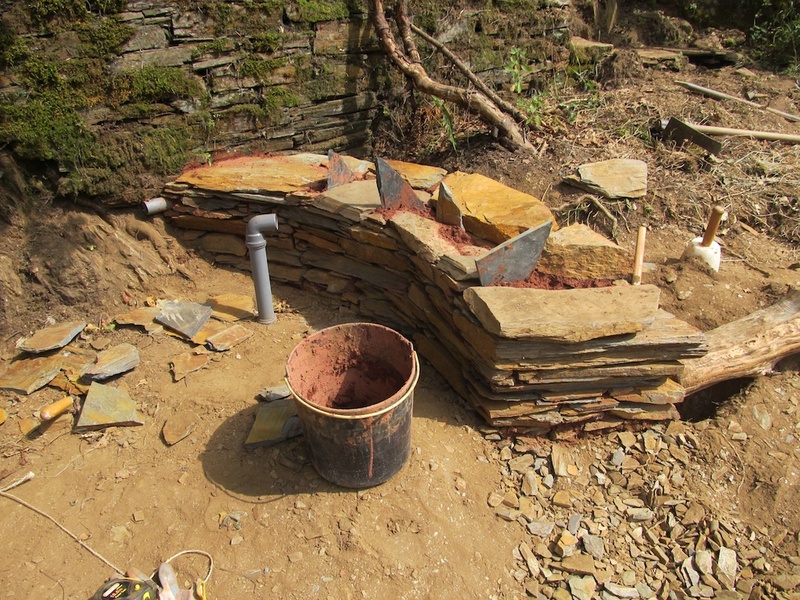 The schist bedrock and fern and moss-covered dry-stone schist wall built onto it that comprises the rear wall is exactly how it will stay. 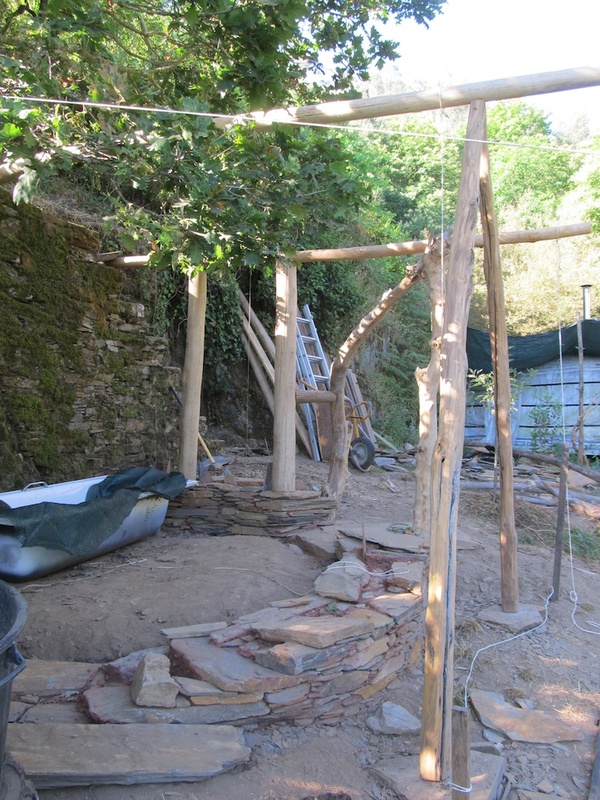 We’re not removing the vegetation or proofing it against the small amount of water seeping through it in wet weather or splashing onto it from the shower. 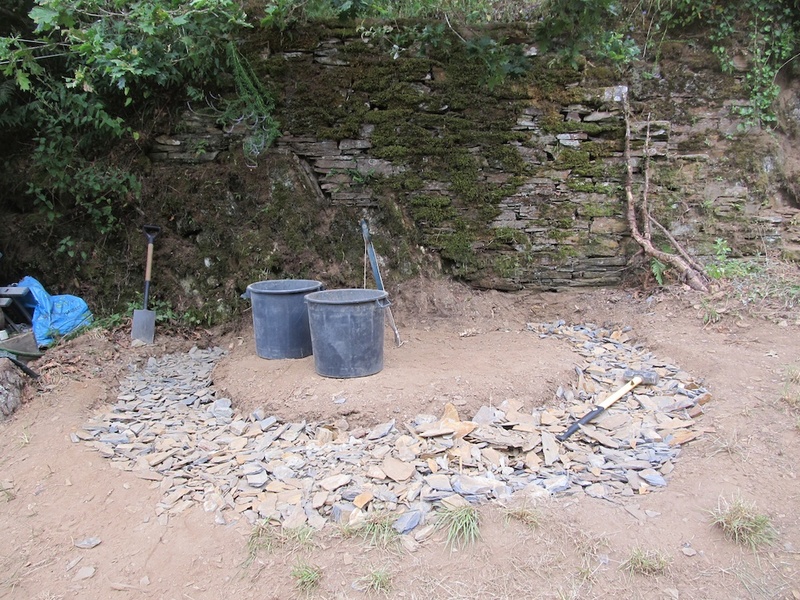 The water will keep the moss and ferns alive and any surplus simply drains straight down through a rubble trench behind the bath and toilet to a level below the foundations. 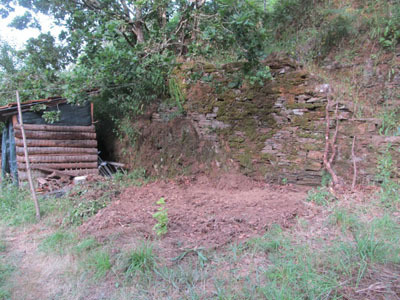 The only places where water needs to be prevented from running down the wall is where the cob walls meet it: it would lead to the failure of the cob. 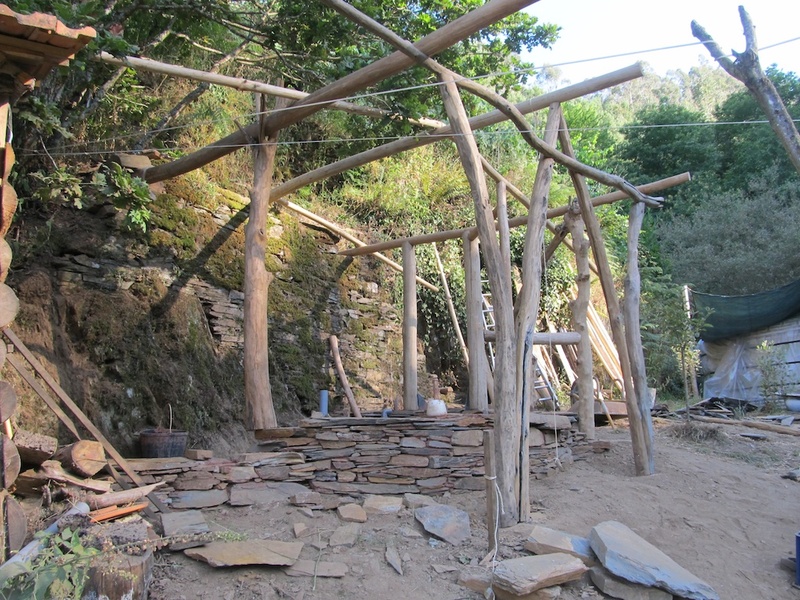 I built the foundation walls from schist which we already had onsite, some brought from the community mine further up the mountain for work on the main building, some dug in the process of excavating the site for the rainwater collection tank. 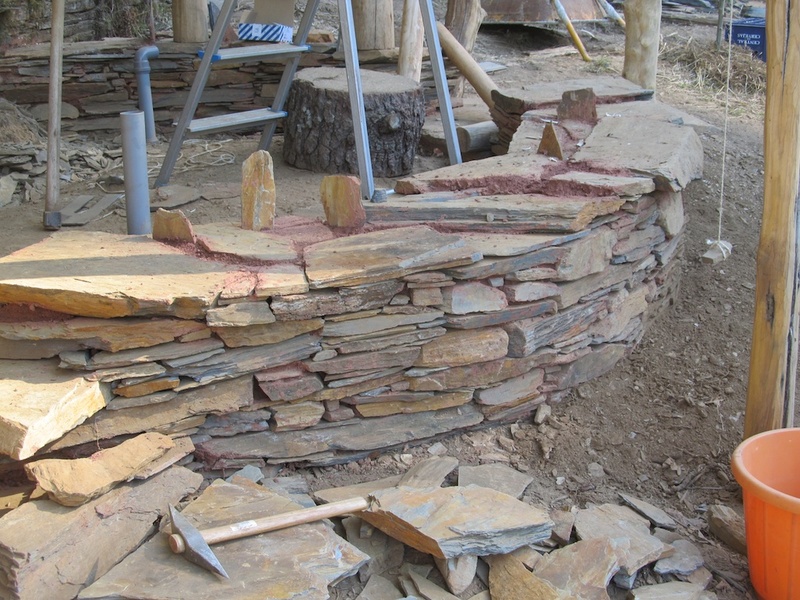 Because schist is a laminar slate-like rock which mostly breaks into slabs, it’s not so ideal for cob to adhere to, so the wall’s upper surface is studded with upright pieces of schist wedged between stones and thumb-shaped depressions in the mortar to provide a key. 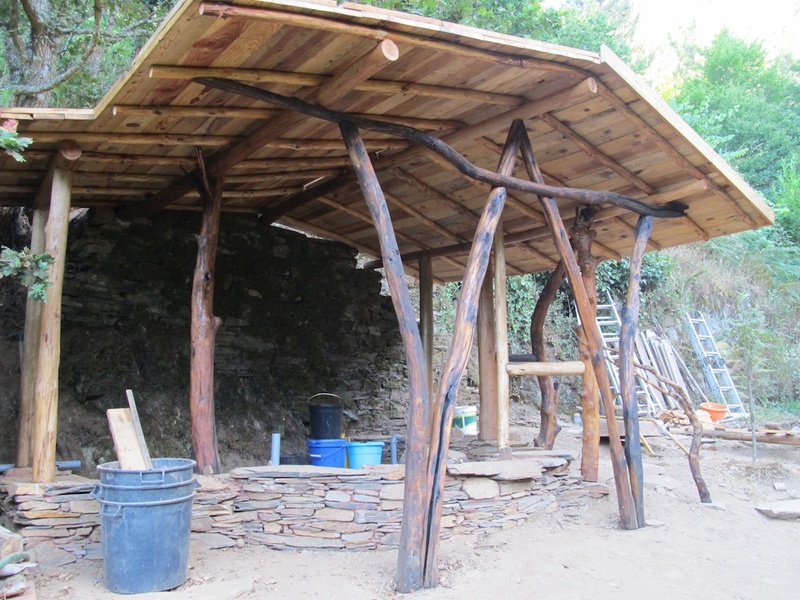 I used a clay/sand/earth mix for mortar (proportions are 1 bucket clay to 2 sand, 1 earth, mixed to a sticky plasticity with bare feet on a tarpaulin) and have been well impressed by the fact that we’ve been clambering and stomping all over the walls to erect the timber frame and not one stone has moved. 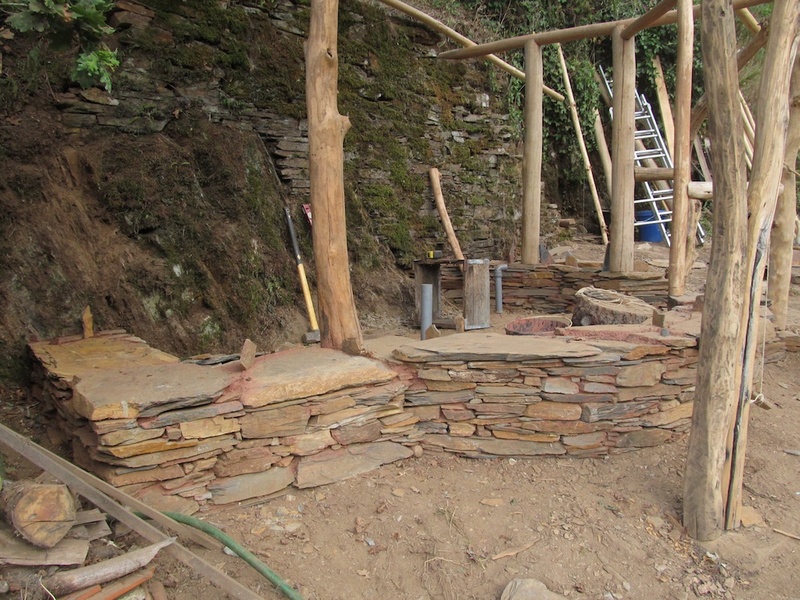 (It’s also gratifying that my first serious attempt at stone wall building has so far proved robust!) 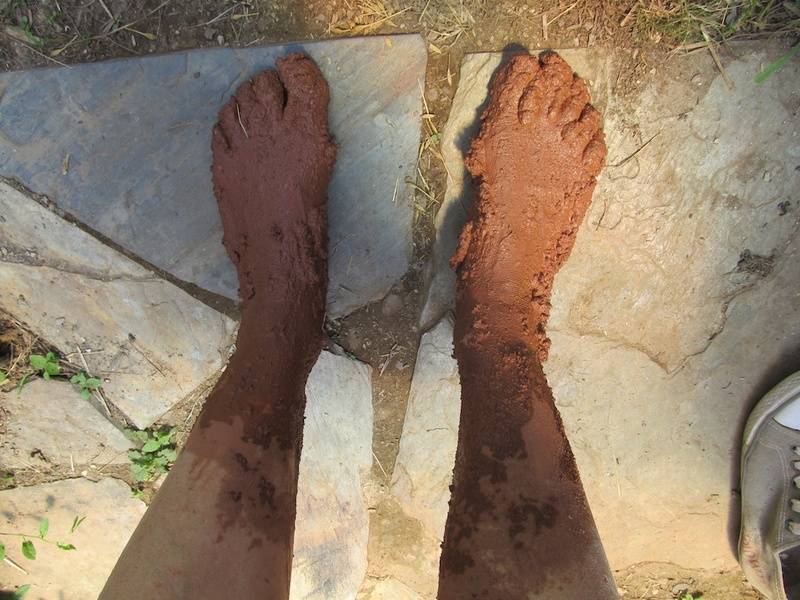 Clay mortar is so nice to use: it’s not caustic like lime or cement, so can be used with bare hands, and mixed to a perfect consistency can be literally thrown into the gaps between stones with a hugely satisfying ‘splot’ … Although clay will dry skin after a while, vegetable oil or moisturiser at the end of the day is all that’s needed. 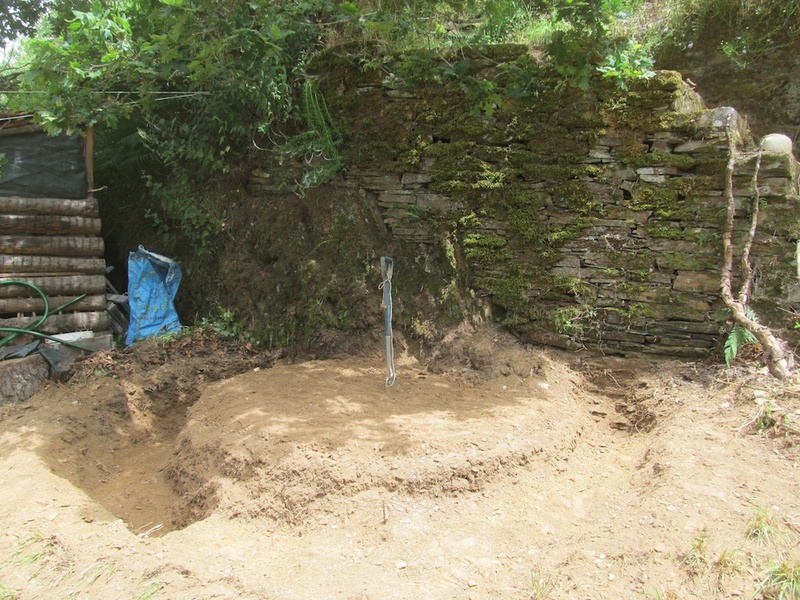 The foundations are just over a foot and a half (48cm) wide on a slightly wider schist rubble trench of varying depth depending on where we hit bedrock. 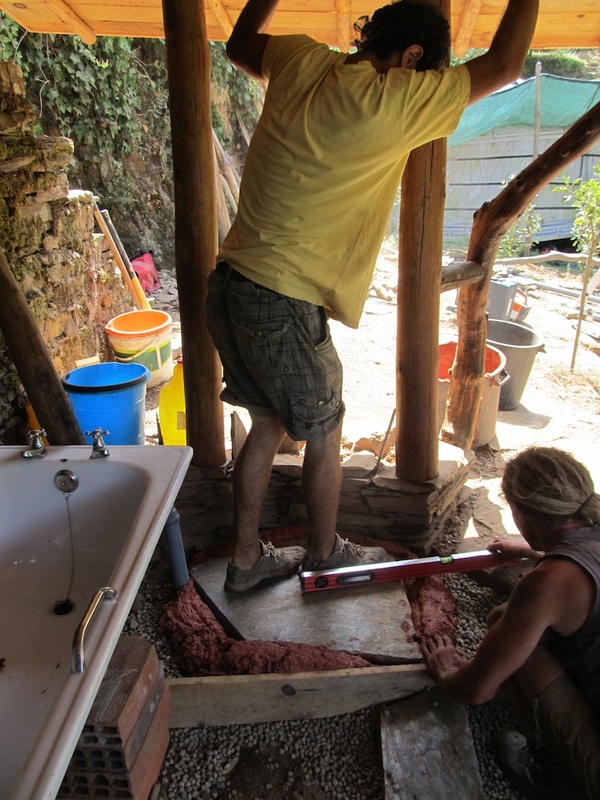 The building is on a slope and rather than hack out a completely level site for it, we went with the slope, so the interior floor has a change of level between the bathroom and the toilet alcove. 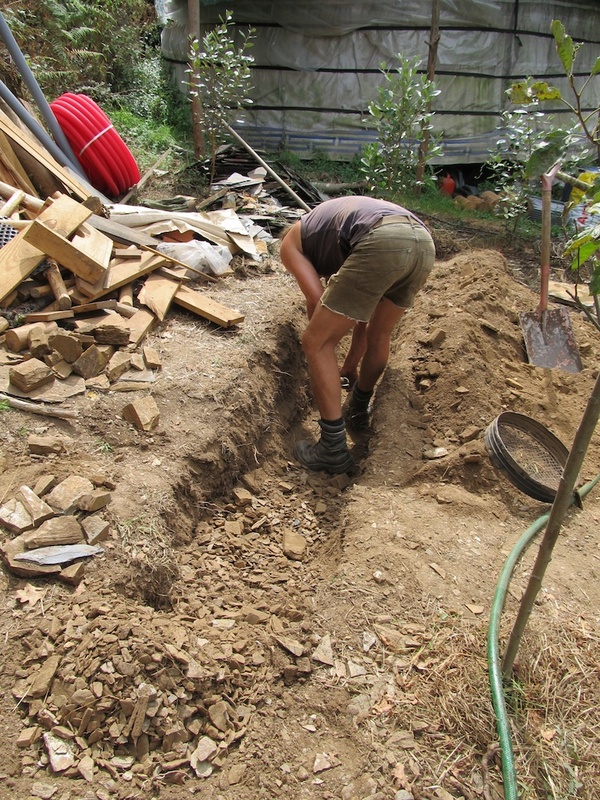 The walls consequently vary in height from one side of the building to the other and between inner and outer levels, but are mostly as high as the cob walls will be thick – around a foot/30cm to a foot and a half/46cm – and are levelled on the upper surface to minimise shear stress. 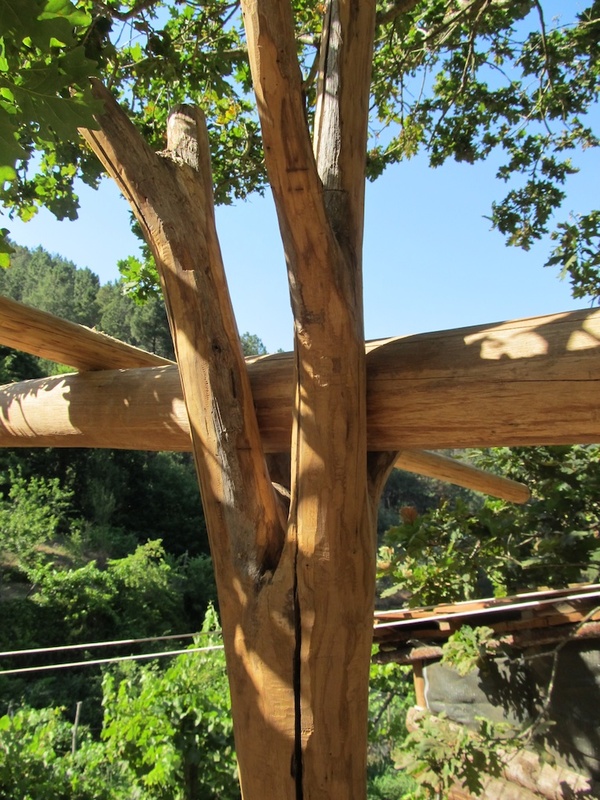 The eucalyptus and chestnut supports for the framework are anchored to the foundation walls with lengths of rebar drilled into suitably robust slabs of schist. 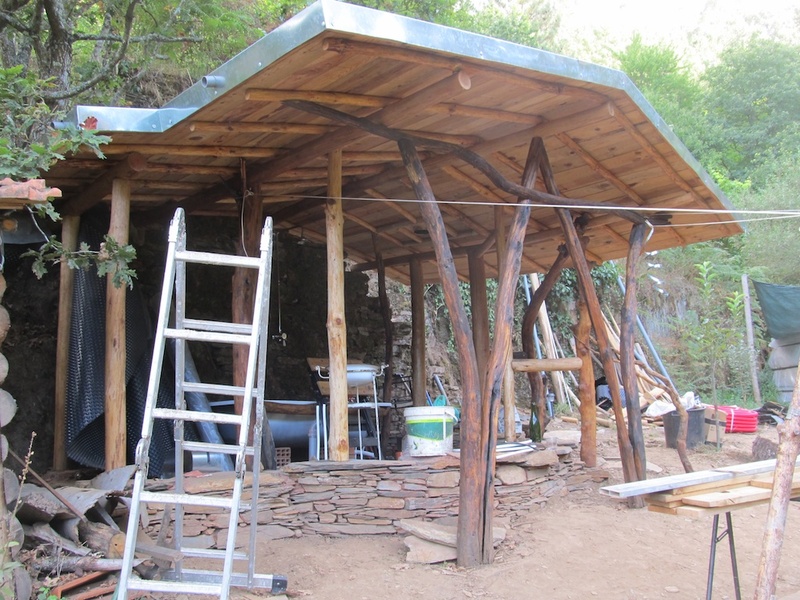 Most are placed to perform a dual purpose: roof support + door frame, room divider, clothes hanger, etc. 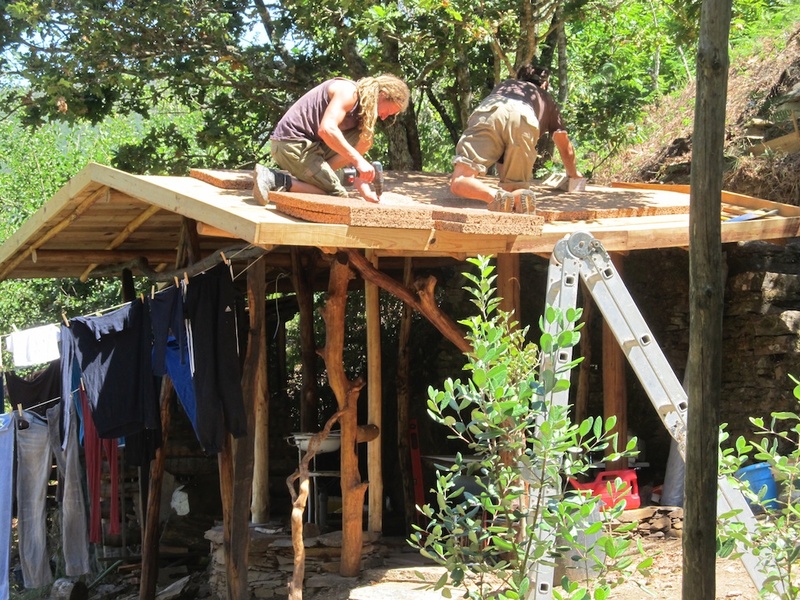 The living roof construction follows the same basic layout as the rear roof on the main building with the addition of a 50mm layer of cork insulation over the planking of the interior of the building. 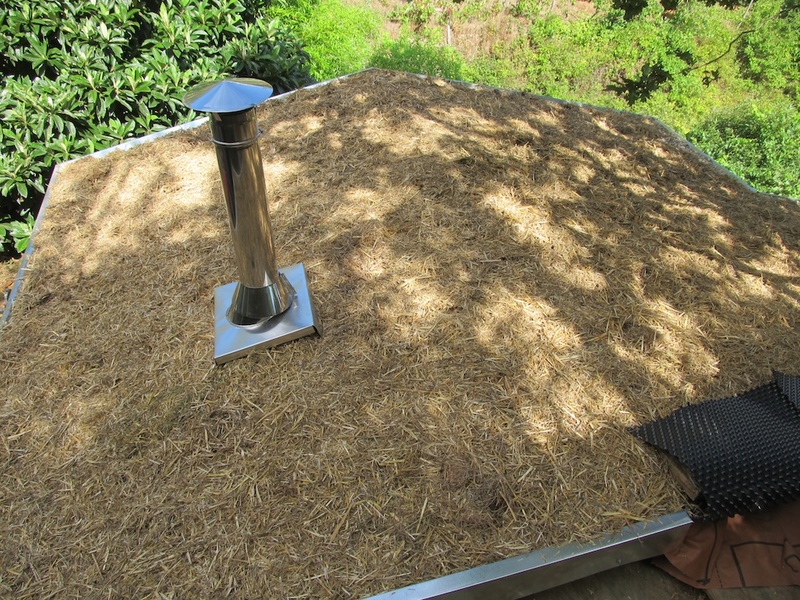 While this creates an uneven base on the roof on which to lay the membranes, this still sheds water as it should and is invisible in the finished roof where straw and soil fill the spaces. 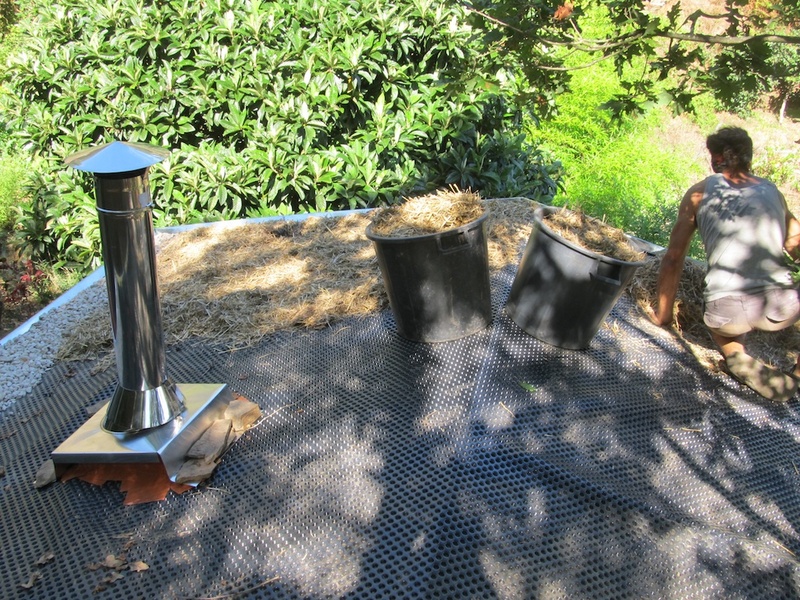 It also gives extra depth of soil towards the eaves. 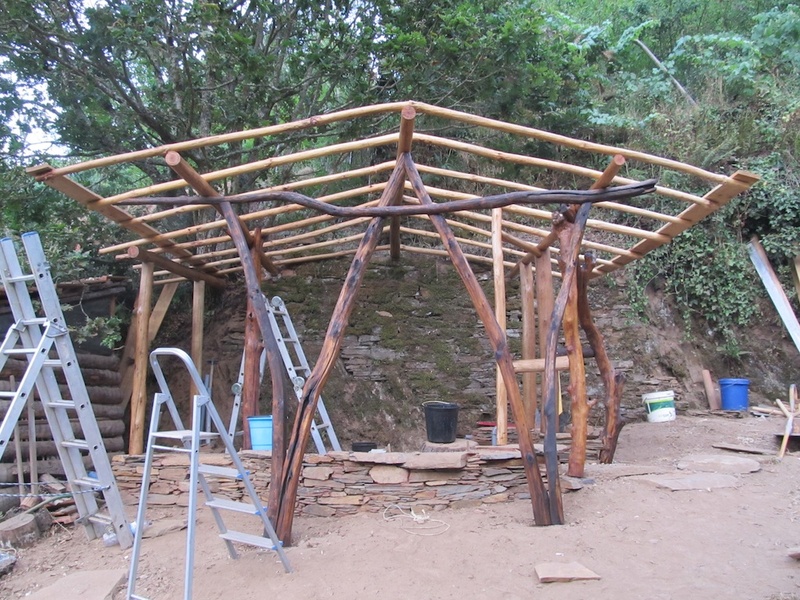 This is designed to be a light extensive roof with a thin layer of soil over a bed of straw, enough of a substrate to provide a base for the plants I intend to grow, but with minimal load and maintenance. The straw will rot down over time, but by that stage it’s hoped the plants will have achieved full cover. 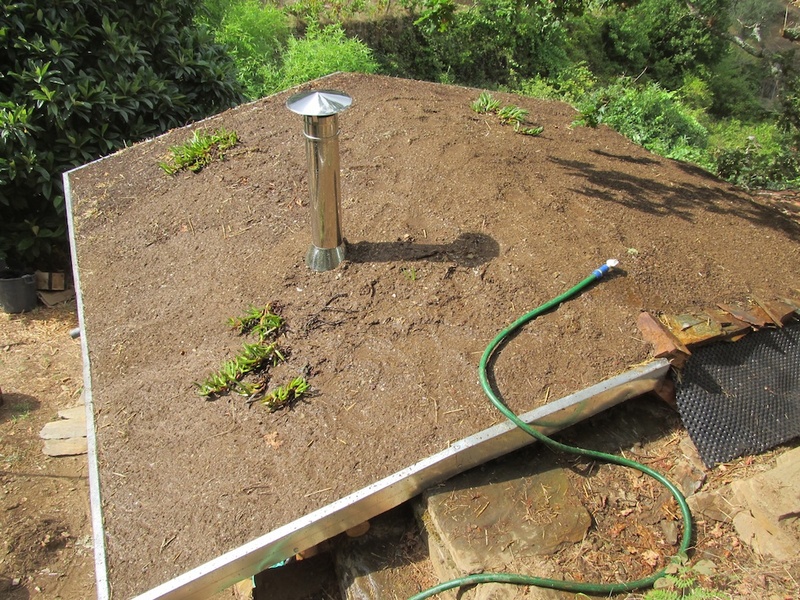 The roof is sown with Chorão (Carpobrotus edulis), a succulent species introduced to Portugal from Africa and widespread in the sand dunes of the Portuguese Atlantic coast where it has the status of weed. It outcompetes native dune-stabilising species but with its shallow surface root system, it doesn’t have the same effect on the dunes. But for our purposes it’s ideal. It quickly forms an impenetrable matt of vegetation with a non-invasive root system, requires next to no soil to speak of and can survive in very dry conditions. We picked up some of the plant on a trip to the coast. 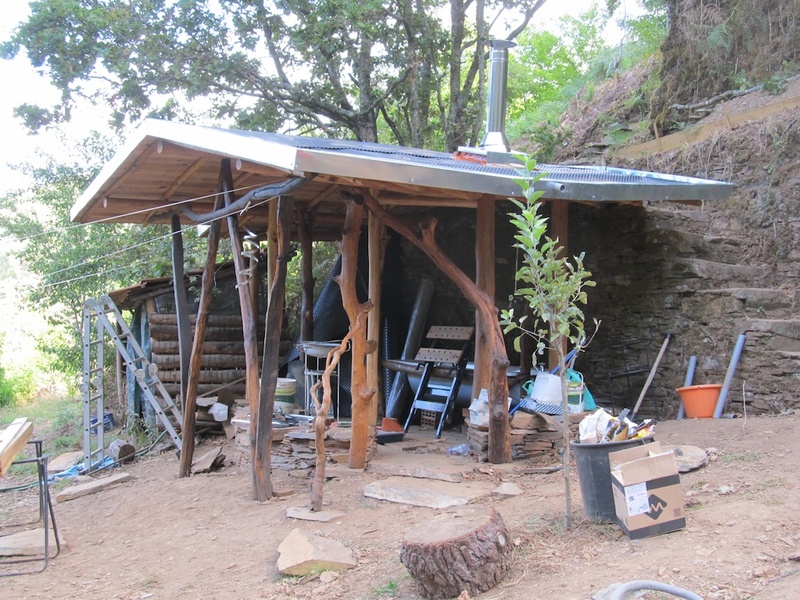 Material costs for this build have been very low: limited to cork insulation and roof membranes (both of which we had insufficient leftovers for), 2 sheets of zinc for covering the barge boards, Leca (lightweight expanded clay aggregate) for earthen floor insulation, one double-glazed window unit (another 3 came free from a local scrap yard), a couple of cubic meters of sharp sand, a mega-bale of straw, clay (which I’d already purchased 12m3 of from a local brick factory in anticipation of the amount of clay-based insulation, plastering, earthen floors and cob construction we’ll be doing), and all the screws, fixings, plumbing and electrics. 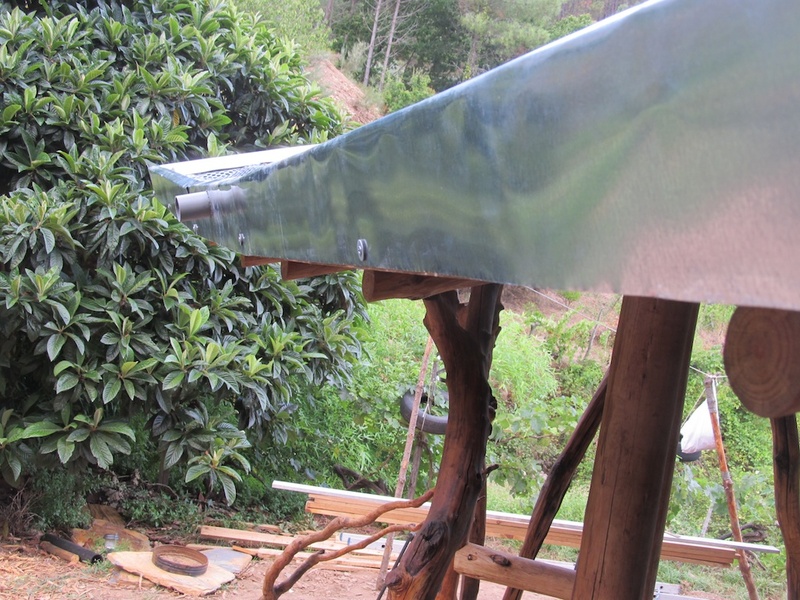 There will be a Portuguese stainless steel wood-burning water heater (bailarina) to add and a storage tank (a recycled 1,000-litre IBC) a couple of terraces above for the water supply, but that ought to be pretty much it. 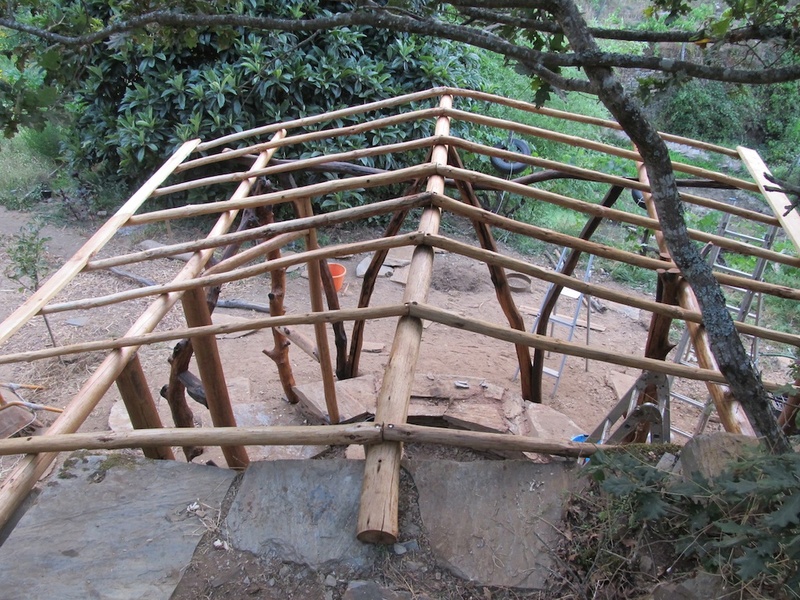 This is a slideshow of its evolution so far up to and including today’s completion of the roof. Click on the image to view full size. I’m loving every moment of this build and I think the mens are too. 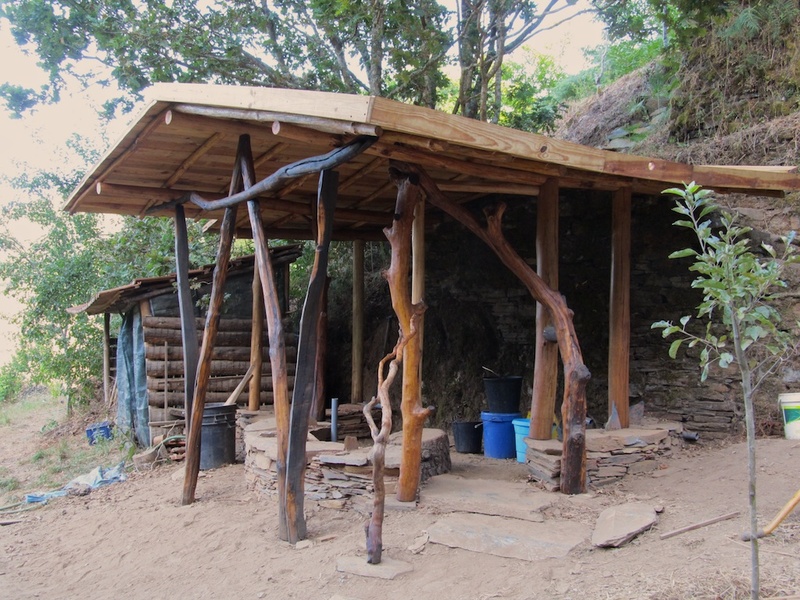 It’s very different from renovating the existing buildings, fun though that is. 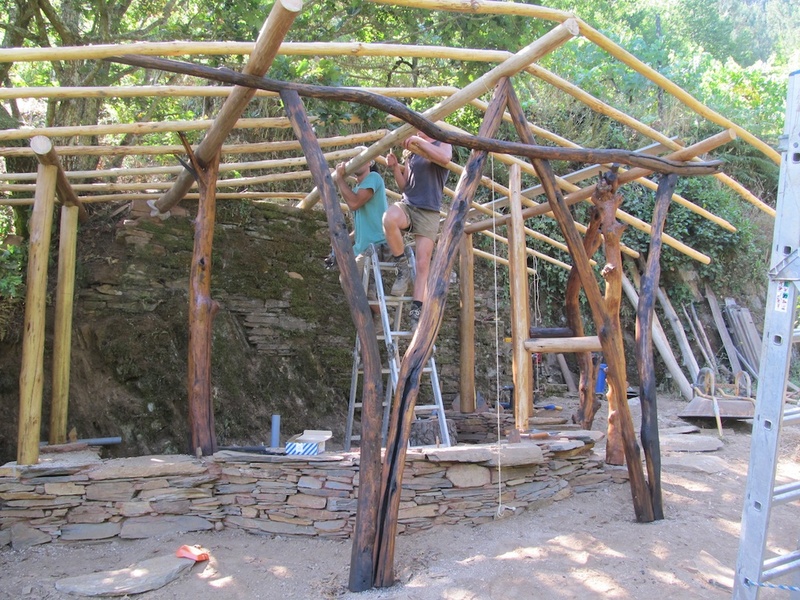 I’m not sure whether it’s this abiding sense of the building building itself through us, or the ground-up design and construction which gives us almost total freedom to be as creative as we want, but experiencing it taking shape under our hands is a revelation and a delight. It’s everything I anticipated in taking sculpture to the level of buildings – and now I come to think of it, this sense of the building building itself through us is identical to what happens when I’m sculpting stone – plus a lot more besides. It’s just so completely satisfying! The engineering side of things is no less fun than the aesthetics, expressing the rational logical urge and keeping things in balance, and the sensual tactile qualities of working bare-handed with natural materials and treatments is pure pleasure, as is the knowledge that there are no toxic residues harming either us or the environment to worry about.